Café Side Chairs deliver guest satisfaction areas by providing comfortable, inviting seating that is built ready for indoor and outdoor use. Available with or without side arms ready to mix and match for a simple, clean and trend setting. 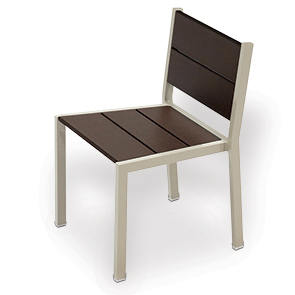 These café style chairs are constructed with lightweight, durable, easy to maintain aluminum and recycled plastic materials. 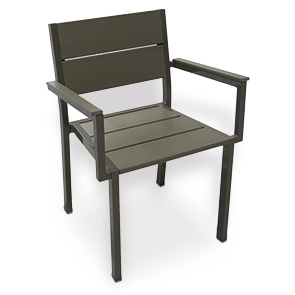 The aluminum frame is finished with a beautiful top-of-the-line powder-coat that protecting the material from rust, corrosion or chipping and the recycled plastic slats can simply be wiped clean. Create a distinguished, blended setting with matching backless bench and café tables.